This walkthrough tip comes from Julie Gauthier (@MrsJGauthier). It is excerpted from Best Walkthrough Practices, a book full of insights and expert advice from school leaders. Subscribe to MindTrust, Mentoring Minds’ network for principals, to download Best Walkthrough Practices for free and gain access to more resources designed just for principals. Learn best practices for fine-tuning your walkthrough habits from principals currently serving in schools across the country and from our own experts—former principals on staff at Mentoring Minds. I have found that once the year starts it seems to fly. I am an elementary principal with 455 students and 45 staff members. Our district does not have assistant principals, so it is all me. I spend a tremendous amount of time before the teachers and students come back, planning out my time for the entire year. Keep in mind that just like we tell our teachers to be flexible, we have to do the same. So, when something is scheduled and doesn’t happen, I just move it to another day. Let’s face it. 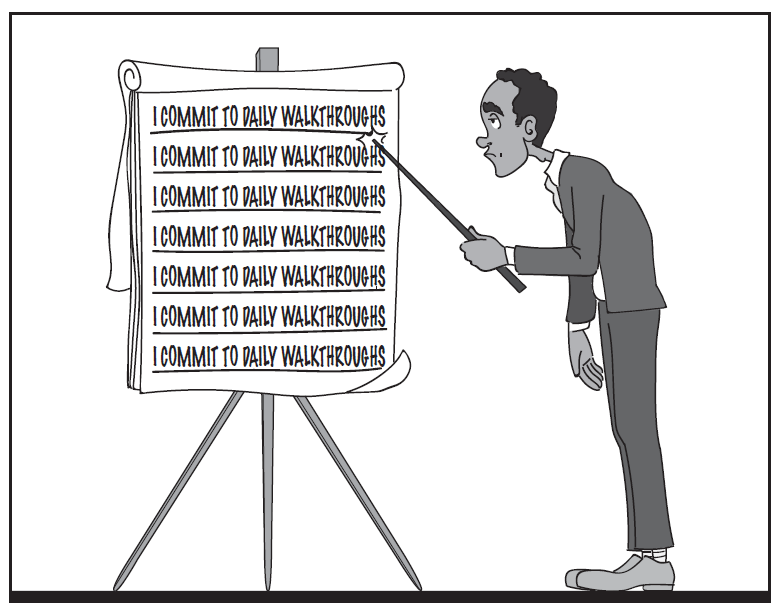 Committing to frequent walkthroughs sounds daunting. I add all the events that are scheduled for the year into the calendar and choose “walkthrough days.” I list the walkthrough days on my personal calendar, not the campus one, so they remain unannounced. At this point, I save the “walkthrough days” as an all-day event so that it goes to the top of the calendar where I list my tasks that need to be completed that day. I ask teachers to send me their daily schedules. I look at the schedules as a grade-level group and select four different times that would be good to walk through each classroom during the year. I found that I developed the habit of doing all my walkthroughs first thing in the morning because it was usually easier to get out. Limiting visits to the morning did not give me a true reflection of the daily tasks of the classrooms. Once I have determined my four blocks of time, I revisit my calendar and assign times to the different walkthroughs for each grade level. If for some reason something happens and I am unable to get away during the scheduled time, I just click on the event and move it to another day. There have been several times that a walkthrough was moved for up to five days–that is just part of the life of a principal. You will note this calendar contains my to-do list for the day at the top, my personal items (like my daughter’s dance schedule), and my campus scheduled events. 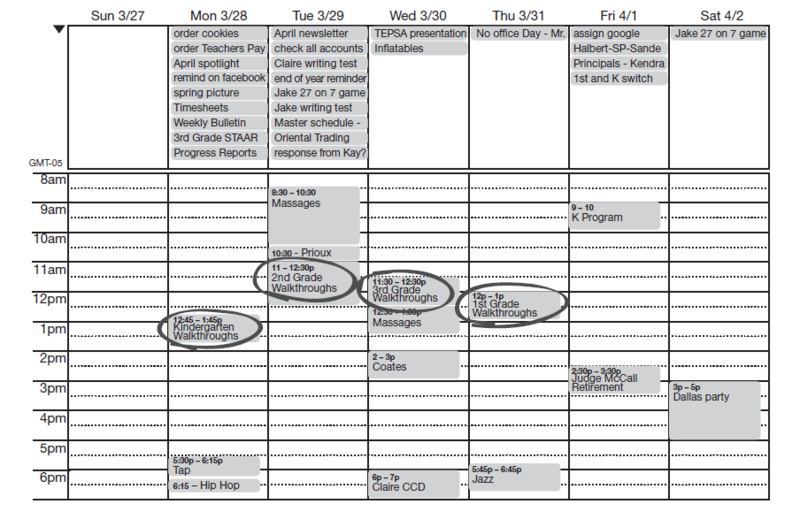 A sample weekly schedule incorporating walkthroughs. I have found that selecting one grade level a day to visit provides me with a great picture of the pace of instruction, classroom expectations, and discipline for each of my classrooms. It also gives me the opportunity to learn about different teaching styles and equips me with better feedback to share with the entire grade level. I may determine what one teacher is doing in her classroom to help her students grasp the skill could help other teachers. Our teachers plan together and teach the same skills. Although they may not be in the exact same place in any given walkthrough, the teachers are usually still teaching the same skill. Julie Gauthier (@MrsJGauthier) is principal of Ridgewood Elementary School in Port Neches-Groves Independent School District in Port Neches, Texas. She was named as a finalist for the 2016 Texas National Distinguished Principal Award by TEPSA. Discuss your walkthrough challenges and successes in the Mentoring Minds Idea Lab, a LinkedIn group for principals. Subscribe to MindTrust, Mentoring Minds’ network for principals, to download Best Walkthrough Practices and gain access to more free resources designed just for principals.